Before Lopez Obrador had even taken office he held a referendum on the partially constructed $13 billion Mexico City airport. He used the resulting vote as a green light to cancel a project he had campaigned against. During his first month in office, Lopez Obrador launched a military assault on the country's fuel theft gangs, dividing the security of Mexico's critical pipelines and refineries between the army and the navy. The hastily planned offensive created gas shortages across the country, but somehow didn't dampen his popularity. This month, he overrode complaints by human rights campaigners and got the Congress and state legislatures to approve constitutional reforms creating a heavily militarized National Guard that he touts as the key to getting control of Mexico's runaway violence. A typical day starts with his 6 a.m. Cabinet meeting, focusing on security, where he gets the daily crime report. At 7 a.m., he steps on the dais at the centuries-old National Palace to start a free-wheeling, open-ended press conference that often goes for 1 ½ hours. From there he might hold a meeting on the initiative of the day, and then around noon he flies off — tourist class, fielding hugs and taking selfies with fellow passengers — to some provincial city, where he'll meet with local leaders, eat at some modest local cafeteria, then hold another open-air rally and take some more hugs. Then he'll catch another tourist-class flight to Mexico City. (He says he gets to bed early). The part of the day he most clearly enjoys? Pressing the flesh and handing out time-tested one-liners at rallies in provincial towns — essentially, the same thing he has been doing for the last 20 years on the campaign trail as a three-time presidential contender. "He is a bit messianic, meaning evangelical. He's out there preaching all the time," said Federico Estevez, a political science professor at the Autonomous Technological Institute of Mexico. "He's Bernie Sanders with power." "I'm not sure if this a good governance model, but it's an exceptionally good political one," Estevez said. It's easy to lose sight of how different this all is, unless you've lived through decades of Mexico's distant, imperial presidency, in which the president seldom appeared beyond orchestrated speeches, or as a motorcade of luxury vehicles speeded to the president's personal airplane hangar for flights aboard the presidential jet to carefully guarded events. Gone are the motorcades, gone is the jet, gone is the security, gone is the official presidential residence. 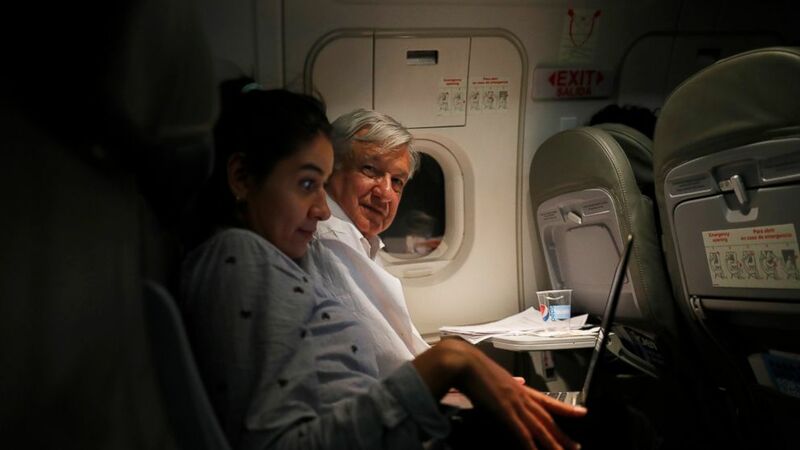 You're more likely to see Lopez Obrador buying himself a $1 styrofoam cup of coffee at a convenience store or eating beans at a roadside restaurant, than to see him rubbing elbows with foreign dignitaries. Lopez Obrador rode a wave of popular discontent with corruption in Mexico, and has attracted a near-unquestioning devotion because of his own honest, rumpled style. "The advantage that Andres Manuel has as leader is that he arrived with a backing that no president has had in Mexico," said Benjamin Arditi, a political science professor at the National Autonomous University of Mexico. Lopez Obrador has already had spats with NGOs, regulators, environmentalists, outside experts and ratings agencies. His campaign against crime and violence has yielded few results. He chafes at those who ask for feasibility or environmental impact studies for his pet projects. But hardly anyone notices. "There is a devotion, something almost religious," said Jose Antonio Crespo, a political analyst at Mexico's Center for Economic Research and Training. "It makes people believe only what he says, against everything that experts or ratings agencies or international organizations say. They don't matter, it only matters what he says." At least two ratings agencies have downgraded their outlook on Mexico's debt to 'negative' since he took office. His decisions — like the one to cancel the airport project, "don't generate the slightest bit of confidence," Crespo said, "and that is going to have a cost, is having a cost, in terms of capital leaving, or money not being invested." For Lopez Obrador, Mexico's foreign policy boils down to simply non-intervention, and he leaves the field to his top diplomat, Marcelo Ebrard. But some critics say Mexico is doing Trump's bidding by accepting the U.S. "remain in Mexico" program and by restricting the movement of caravans of Central American migrants. "Remain in Mexico" makes Central American asylum applicants await resolution of their cases from the Mexican side of the border. "It is a U.S. policy that once again subordinates Mexico's immigration policy," said Oscar Misael Hernandez, an immigration researcher at the College of the Northern Border in Matamoros. Others saw it as a pragmatic calculation that U.S. courts will soon put a halt to the program. Allowing it in the meantime helps U.S. relations and helped Mexico win a $10.6 billion U.S. commitment for regional development, meant to create jobs in Central America and southern Mexico so fewer people feel compelled to leave. With growing signs of anti-migrant sentiment in Mexico, containing migration costs Lopez Obrador little in political terms, and is balanced by his push to grant work visas for migrants. The new administration's most widely criticized misstep was Lopez Obrador's decision to axe funds for nonprofits working on issues ranging from promoting art and culture to providing domestic abuse shelters, arguing the "intermediaries" were too often used to siphon away government funds. Lopez Obrador wants to give the money directly to the people who needed it, but experts say that won't work for complex social services like day care and shelters for battered women. Mariana Banos, whose Fundacion Origen offers support services to women — often through partnerships with other organizations and local governments — said many groups will have to shut down because they depend entirely on government funding. She scoffed at the corruption allegations and urged the government to reconsider. "You have to work hand-in-hand, not create a divide, not stigmatize," she said. Despite the frictions there are lighter moments to "The 4-T," a play on Lopez Obrador's description of his administration as the "fourth transformation" of Mexico. Lopez Obrador sometimes laughs at his own jokes. He posts Facebook videos from roadside restaurants, with impromptu lectures on the health benefits of coconuts or local fruits. And Mexicans crack up at his frequent, folksy catch phrases like "Me canso ganso," equivalent to "I'll be a monkey's uncle." Enterprising designers have come up with a web app that allows people to make resolutions and receive a text message from an AMLO-bot saying "Monica, you'll lose weight this year, or I'll be a monkey's uncle."